And here we are, NOW, on the threshold of another major milestone for Hawai’i Farmers Union United, in service to family farmers and the ohana’s they feed. We are in the final process of becoming a chartered state chapter of the National Farmers Union. In 2012, after three years of traversing the rocky terrain of finding our way as an organization, I became state President of HFUU. When I attended my first national board meeting on the mainland it became apparent that if we were going to fulfill our vision and mission as an organization we would need to become chartered with that national parent organization. Considering the level of structure that was modeled by NFU and its most active chartered member states, I knew we had our work cut out for us. 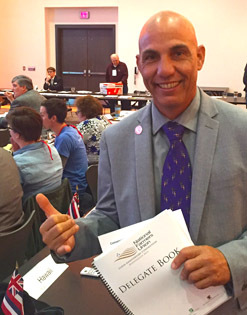 Yet, sitting at the table with the NFU board, which is comprised of the other state chapter presidents, I soon realized that NFU was committed in helping the unchartered states to become chartered. All we had to do was reach a certain membership threshold, have our core leadership and governance in place, and have our financial house in order. NFU assisted us in meeting those milestones by extending a grant of $150k over five years. And now, due to the hard work of those who have shared both the vision of a local food movement in Hawai’i, and, the participation of our membership, NFU will see the fulfillment of their faith in HFUU. Was the seven-year climb at times frustrating and challenging? Of course. But also, stimulating and inspiring due to the many volunteers that showed up to share the load with their unique gifts, mana’o and personal resources. The historic acknowledgment is going to take place on a stage set at Kahumana Organic farm, Oct 7th, the second day of our three-day annual convention. The convention begins on Oct. 6th opening with a Ku’i ceremony; pounding taro into Pa’i’ai. Immediately after this culturally symbolic honoring of our commitment to the life of the land, we, as an organization will be receiving a charter from a representative delegation of the national farming organization. They will be in West O’ahu for the sole purpose of welcoming us as a chartered state chapter into the 115-year-old organization we first engaged with back in 2009. What does being charted mean? As a chartered chapter of NFU we will have statutory and regulatory entrees into the legislative process, representing what would best serve our agricultural interest nationally, as it relates to us locally. Becoming a chartered state sends a message that we are committed as an organization to uphold a representation of the values of our mission in advocating and creating vibrant and prosperous agricultural communities here in Hawaii Nei for our family of farmers, and doing it under the tent of a national organization that holds space for our values. What it takes to actualize this as an organization is having a shared vision, clearly articulating our goals and then setting out to achieve them at a steady rate, staying the course while dealing with the reality of living within a system and state whose idea of local agricultural support and representation is translated into .37% of the state budget. Just because state “authorities” outside of HFUU’s mission haven’t yet found the political will to embrace our vision of regenerative agriculture and a return to healthy soil management practices doesn’t stifle our enthusiasm for what is possible. And while we have accomplished much, we must continue to use our collective voice, backed by the authority of our parent organization, and our engaged and committed membership in support of the local food movement. This includes the family of farmers, gardeners, ranchers, fishermen and foodies who are striving to make a living doing what they love to do. A Field of Female Farmers – Courtesy of Rachel LaDrig, HFUU Wai’anae chapter. My request to all who support our mission is to make sure you are a current member of HFUU. In line with their consistent encouragement, National Farmers Union is offering HFUU $100 in capacity building support for each member over our last 3-year average of 800 members. These funds can be used to support some of the key leaders who have been volunteering the bulk of their time in years past, and who remain committed to our mission. By registering and attending our annual convention you not only have the opportunity to learn from experts in various fields, network amongst your colleagues and be well fed, but you will also be part of HFUU history in the making. When we feed ourselves and community; when we work in collaboration and cooperation with nature and with one another; when we appreciate what our agricultural practices can give us, we collectively find peace of body, mind and spirit. Aloha and Mahalo Nui for your continued support of HFUU. Aloha Vincent, Awesome article and information. Itʻs very encouraging to read how far this has come and all the work that has been put into this is being noticed. Mahalo to you, your colleagues and all those who support HFUU. Much success on the upcoming convention and for all your endeavors for the future. 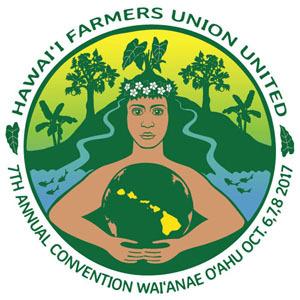 My Husband Sammy Walton and I, Sharon, attended the HFUU Oahu 2017 growers convention and we learned so much helpful information and knowledge. Priceless information to know for our future and future of everyone. The conference was well organized and fun too. The speakers were very nice and super knowledgeable. Mahalo.